Do you just love those cute family name plaques, but hate the price? Yeah, me too. Literally I cannot fathom spending $50.00 on something that I can make for $15.00 and style it to fit my house. 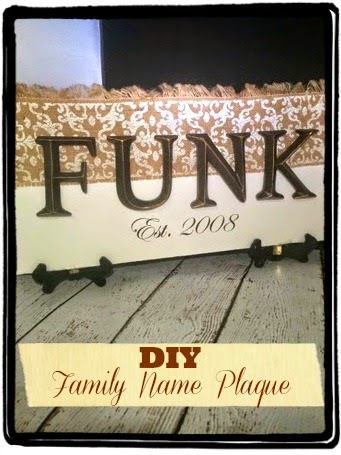 Check out how easy it is to DIY a family name plaque! Whew! Winter break flew by and in these past few weeks I have been a crafting maniac! I made curtains for my hubby’s man cave, knitted boot cuffs, redecorated the living room and kitchen and did a full laundry room makeover. Those are just a few things I decided to take on. 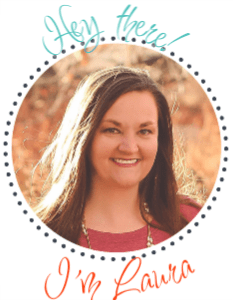 In the coming weeks I will be highlighting the various changes in our house as there are SO many and I really want to show you how to create a beautiful home on a budget. This name plaque is part of my kitchen decor. The kitchen is a huge work in progress, but I want it to be family centered and a name plaque is something that is great to add. Burlap and the vintage feel is really big in design right now. 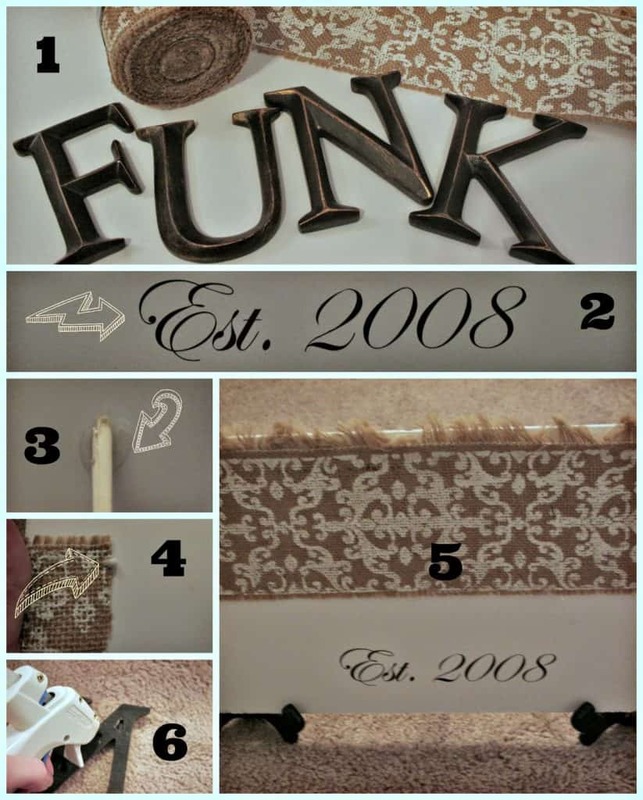 I happened to snag the burlap on clearance for $2.00 and paid $2.00 per letter. The rest of the items I had on hand so in total this cost $10.00 for me to make. Step 2: Cut the foam board to desired size and then add the stickers for the year your family was established. Step 3: Use hot glue to adhere the wooden dowel to the back of the board at an angle to help stabilize the board when it is standing. (you will also notice I have those black portrait holders as well, that is just to give the board a boost above the lip of my kitchen cabinets). Step 4: Cut the burlap and use hot glue to adhere it to the front of the board. Then use the pins to tuck it around the back of the board. Step 5: Using a ruler draw a line with a pencil to line up your letters (my line is not showing up). Step 6: Use hot glue to adhere the letters to the board. I usually start from the center out to get the best spacing. I love it! I cannot wait to show you more of the amazing crafts and redecorating I have been up to these last few weeks.